As much as we love recyling around our home, Christian Louboutins Ecotrash Slingbacks are well... garbage? Literally this winter collection includes rubbish collected from the garbage cans at Louboutin's Parisian atelier. All laid out under clear PVC with leopard printed heels and golden water snakeskin platform trim. Each shoe is one of kind (apparently!) 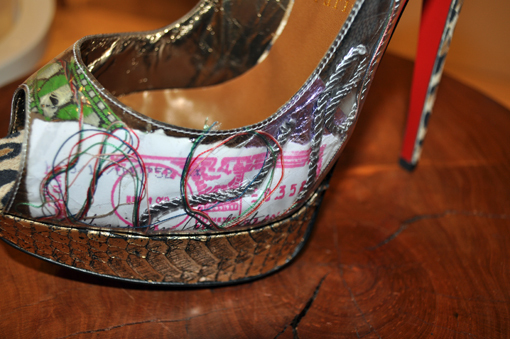 A true test for Louboutin lovers... to which I choose to fail with pride and I'd rather save my $1095. For those that love them, see the rest of shoes on Neiman Marcus' blog, NM Daily.